This week’s newsletter kicks off with one of the largest ‘time only’ vintage Oyster models. The watch has a very handsome silvered dial with lozenge shaped indexes at 3, 6 and 9 o’clock which are interspersed by tapered faceted indexes. The case has a diameter of 36mm and, unlike many other models of the period, the 6424’s lugs are un-pierced to the outside of the case, leaving an unbroken sweep to the polished case sides. Next is an excellent example of the Seamaster Day-Date which is fitted with a steel Omega bracelet. 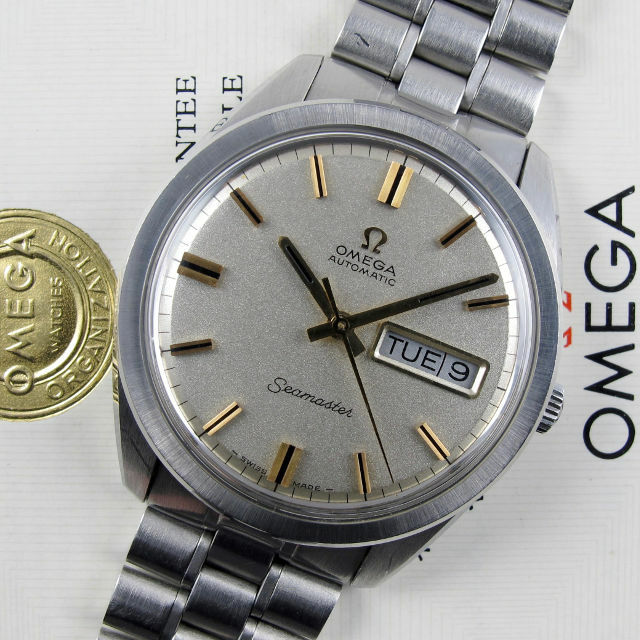 The watch is accompanied by the original, numbered, Omega guarantee booklet which notes that this watch was originally sold at J. W. Benson in March 1970. 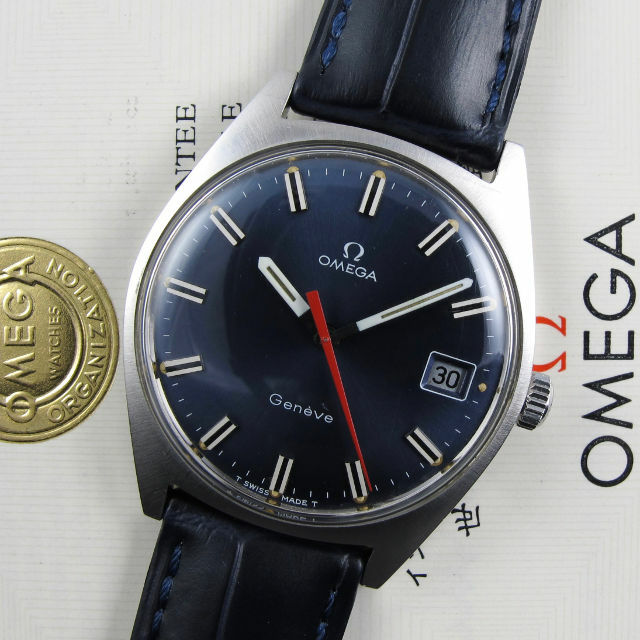 The watch also retains the original red Omega presentation box and outer card case as well as the red Omega plastic folder containing special ‘Day/Date’ adjustment instructions and ‘You and Your Omega’ booklet. This wristwatch has a rich, midnight blue, satin finished dial. The indexes have silvered surfaces and black centres which are styled to match the hour and minute hands. 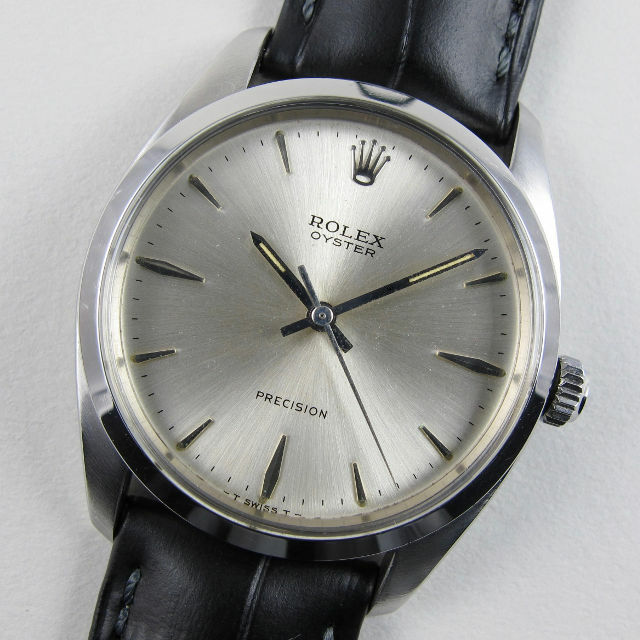 A great looking version of the model, this reference (136.041) was predominantly manufactured with a silvered dial, examples with the blue dial are considerably more unusual. 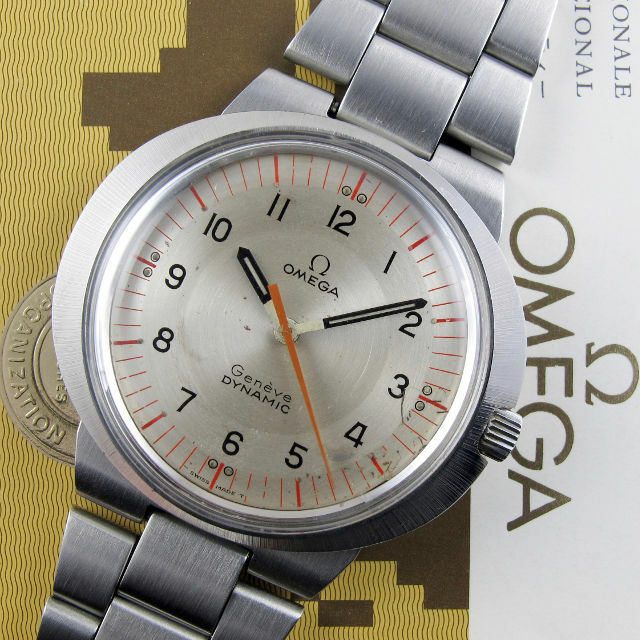 This watch is accompanied by red Omega folder with original numbered Omega guarantee booklets. Above is an incredibly unusual version of the Genève Dynamic which is complete with its original Omega folder containing guarantee booklets. The watch has a very stylish and rarely seen dial design. The silvered dial has a two-tone finish with a circular satin finish throughout. The chapter ring, which bears the black Arabic numerals, is finished with a contrasting higher sheen to that through the rest of the dial. At the outer edge of the dial, the track for minutes/seconds is calibrated in red and there are luminescent, twin dots at each quarter marker with single dots at the intervening hours. There are marks and scuffs to the dial but this does little to detract from its fabulous good looks. 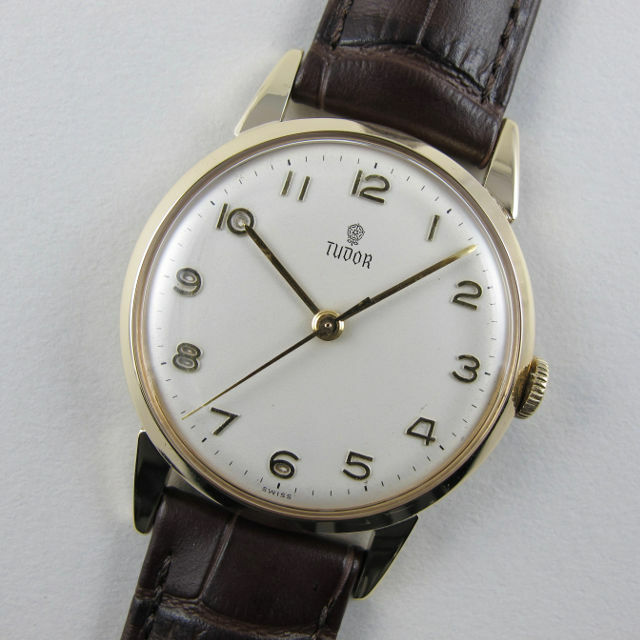 A very handsome gold Tudor model, this wristwatch has a silvered dial with raised gilded Arabic numerals. The two-piece case is made in 9ct yellow gold and has a chamfered bezel and Rolex winding crown. This wristwatch was presented by Scottish Aviation to an employee in recognition of long service and the outside of the gold case back is engraved accordingly. This rare and early wristwatch by Omega dates to the mid 1920s. 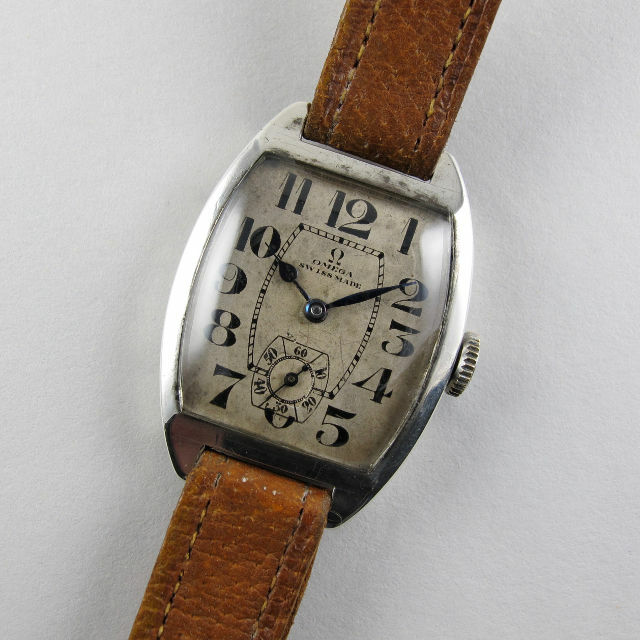 The tonneau-shaped case is one of the earliest wristwatch designs to appear during the early 1900s. As with many watch models of this period, the strap is especially narrow and is attached to fixed bar lugs. The black exaggerated numerals are typical of the Art Deco period and the blued steel spade hands are of traditional form. The dial of this Omega has wonderfully even oxidation and patination to the surface, giving the watch a unique and characterful vintage look. There are slim, black painted Arabic numerals, a finely engine turned subsidiary seconds dial and ‘feuille’ hands. Manually wound, the watch is powered by the Omega calibre 30T2 PC. 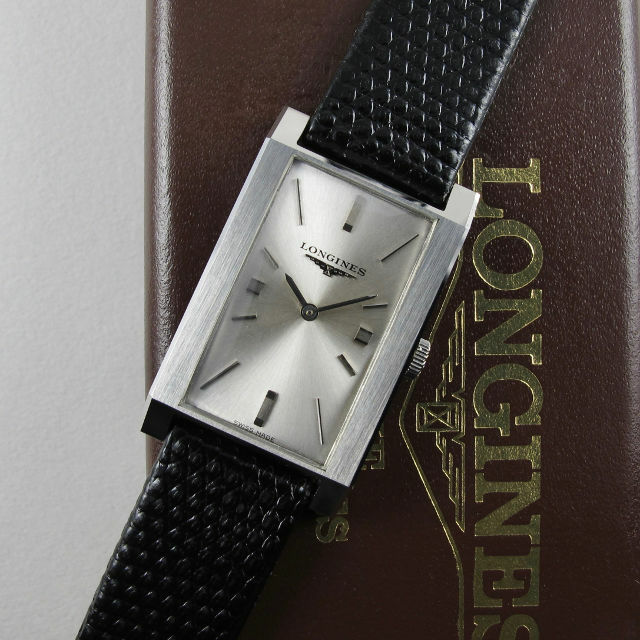 A super sharp example of this rarely seen rectangular Longines model, this wristwatch appears to be in almost unused condition and comes with a brown Longines presentation case. The stainless steel case has a satin finished bezel, with polished chamfers to the edges and down-turned lugs. The shaping and finishing of the case is mirrored by the baton indexes at 12 and 6 o’clock which are both rectangular and follow the case’s design with satin finished tops and polished chamfers to their edges. Manually wound, the watch is powered by a crisp Longines calibre 14.16. 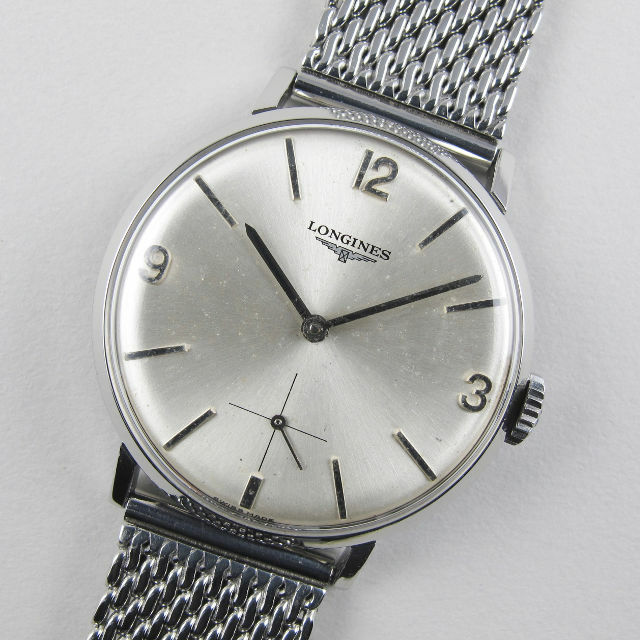 This Longines model has a 35mm diameter case and incorporates the watchmaker’s calibre 302, a movement which Longines had developed from their earlier calibre 30L. The silvered dial has a silk matt, satin finish and there are raised Arabic and baton indexes, together with a subsidiary seconds dial. There is light oxidation spotting across the surface of the dial. We have fitted the watch with one of our steel Milanese watch bracelets which is fully adjustable. 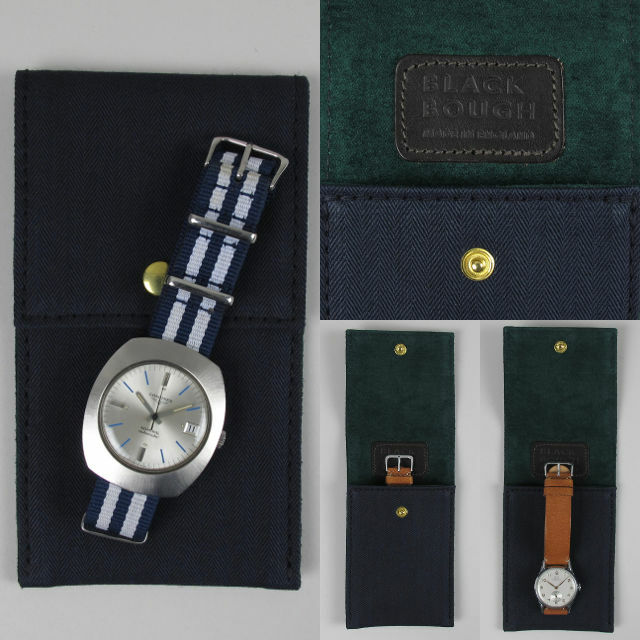 Designed and made in England exclusively for Black Bough, these new wristwatch pouches are made from navy blue, Japanese herringbone canvas (100% cotton) and are fully lined with dark green suede. There is a brown leather Black Bough branded patch sewn to the inside of the flap. Ideal for storing or for use when travelling, these pouches have a brass popper to fasten the flap. 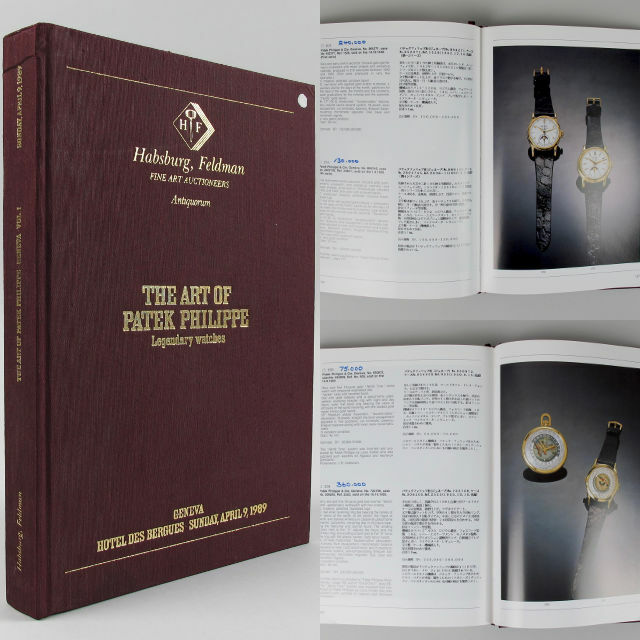 The first important thematic auction solely devoted to Patek Philippe watches, this catalogue was arranged by Hapsburg Feldman auctioneers to coincide with the 150th anniversary of the Genevan watchmaker. Organised by Osvaldo Patrizzi and his Antiquorum team, the sale offered 300 Patek Philippe watches spanning the full history of this famous watchmaker. With each lot described and illustrated in colour, this is a fabulous point of reference for any vintage watch enthusiast and an essential part of any Patek Philippe collector’s library. To automatically receive these fortnightly updates via email, please select the ‘Join Our Mailing List’ tab at the bottom of any of our web pages.